I heard breathing, heavy breathing through a closed door last night. That's not right, I thought and went in and gave Eric some Albuterol through his spacer. A few minutes later he popped into my bed, his breathing was quick and laborious. So, it was 11 by then and I got out the nebulizer for the first time in nearly 2 years. Roughly 20 minutes after the neb, his breathing was still quick and visible (you could see his stomach and his chest really working). I had to take him to the emergency room. Rich was out of town, so I called my mom and 15 minutes later she was knocking on my door. She stayed over to watch Kaylee while E and I went over to Mass General. Mass General at night, is a spooky place. The main entrance is under construction, so you can't even drop patients off near the door. I had to park in an ancient garage designed for much smaller cars than mine. (I drive a Honda Accord) This is odd, because that garage was likely built sometime between 1960 and 1980, not exactly a period in history known for compact cars. Then I carried him to the Emergency room and began an odyssey that left me with a feeling not unlike getting off an international flight in the wee hours. You're exhausted, disoriented and everything around you is very ugly and beige. It turned out that E was fine. The short breathing I heard was just a cold, and his oxygen levels were fine. They kept us there under observation for a few hours to make sure his levels didn't drop in his sleep. He was fine the whole time and his breathing had really improved. I think the lesson is that it sometimes takes nearly an hour for his albuterol to really work its magic. When I take albuterol, the relief is so instant that it confuses me when Eric is still gasping after several doses. But he was fine. They did not admit us and we got home around 4:00 AM. My mom was not, as I expected, curled up in my comfy bed, but crashed on the floor of the den wrapped in a green comforter. I woke her up to tell her we were home, and she came down and slept on my side of the bed. "Move over." I told her. "You sleep on Rich's side." She grumped. So I did. Then, because she's AWESOME, she got up with Kaylee for a couple of hours so Eric and I could sleep in. It's nice living near your mommy when you're 37. At least if you have a mom like mine it is. Fortunately I'm unrelated to Joan Crawford (as far as I know). Yes, this is a hideously unflattering picture of me in my awesome Flutie jersey. 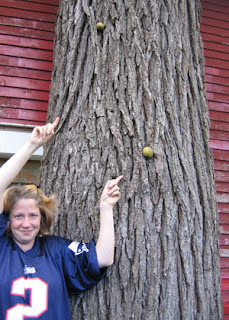 But if you look above my head you will see my not one but two of my gravity defying walnuts wedged into the tree trunk. My dad thinks they'll be there for years to come. I think they will be snatched and summarily devoured by a hungry squirrel before Thanksgiving. I picked Kaylee up from day care today. She is attending an absolutely awesome family day care that I SO wish I had known about when Eric was that age. It would have saved me a lot of money. But woulda coulda shoulda. So, I picked her up from day care today and brought her home and popped her down for her nap where she played and fussed for an hour. The playing gradually diminished and the fussing took over and after multiple visits from me that entailed, a kiss, a gentle lay down and me leaving the room, she finally fell asleep. K's nap doesn't represent a lot of downtime for me. I've still got Eric who is generally pretty needy that time of day. But when I'm alone with him, we can bake or cook and generally do big kid stuff together. And it's quality time for the most part. Although, E's a little under the weather at the moment. He's got a slight fever and he's curled up under a quilt watching Max and Ruby. But usually we spend K's nap doing more interesting, relatively productive things. So, when it looks like she's not going to do it, I get kind of stressed out. I just wish the kids could understand what a fabulous thing an afternoon nap is. If it were up to me, I'd take one every day. Why don't they know what sublime pleasure a little PM nap is? The weird dreams, the evening energy. It all ROCKS.